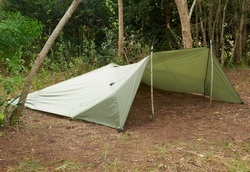 Olive green 210T nylon rip-stop construction. Measures 10' x 10' with grommets on each corner as well as numerous webbing tabs along each side. Features 3 webbing tabs across the spine when used as a fly. Also down two opposite sides are plastic snaps which can allow the shelter to be folded and snapped together to make an emergency bivi if desired. Also included are four guy ropes with 10' adjusters and 8 ultra lightweight alloy stakes. Offers protection from sun, wind, rain, and snow. Designed by military veterans and avid outdoorsmen it can be configured and used as a fly, pup tent, lean-to shelter, or emergency bivvi. Endless possibilites, only limited to the imagination. Comes with stuff sack and zippered storage pouch with carrying handle. Tested in all 4 seasons. This shelter is great for you and a teammate and your gear. the top of the chest section, which eliminates the need for a draft collar. 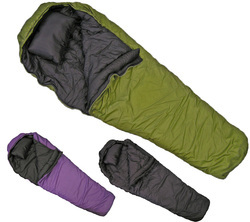 Sleeping bags come with a compression stuff sack and pillow. Be sure to check out the option for the 3-in-1 sleeping bags known as the Flexible Temperature Range Sleep System (FTRSS or nicknamed The Fortress)! Each core bag can be used at a 40 degree F lower temperature by adding an Overbag at the time of purchase or at a later date! Advice? 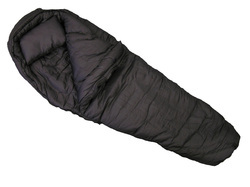 Are you looking for a great Four Season Sleeping Bag that can be used for most of the lower 48 States? The Super Lt.
FTRSS is our most famous and purchased bag both by our Armed Forces and Civilian Markets. THESE BAGS CAN LITERALLY SAVE YOUR LIFE IN THE WILD. THEY ARE THE ONLY BAGS THAT YOU CAN GET IN WHILE WET AND BE DRY BY MORNING. The Ultra Light is a +20 degree F (approximately 0 degrees C) rated mummy style bag. It is vailable in four sizes; 31 inches wide in the torso and 80 inches long (regular regular) (weight is 3.25 lbs. ), 34 inches wide and 80 (regular wide body)(weight is 3 _ lbs.) inches long, 31 inches wide and 90 inches long (long regular)(weight is 3 _ lbs) and 34 inches wide and 90 inches long (long wide body)(weight is 4 _ lbs.). COLORS: Royal Blue, Black, O.D. 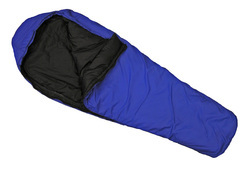 When the over bag is added to the Ultra Light the temperature rating becomes -20 degrees F (approximately -30 degrees C). When both bags are combined you have the Ultra Light FRTSS. The Super Light is a 0 degree F (approximately -20 degrees C) rated mummy style bag. It is available in four sizes; 31 inches wide in the torso and 80 inches long (regular regular) (weight is 4 lbs. ), 34 inches wide and 80 inches long (regular wide body) (weight is 4 _ lbs. ), 31 inches wide and 90 inches long (long regular) (weight 4 _ lbs. ), and 34 inches wide and 90 inches long (long wide body) (weight 5 lbs.). COLORS: Purple, Black, O.D. When the over bag is added to the Super Light the temperature rating becomes -40 degrees F or C. When both bags are combined you have the Super Light FTRSS. Civilian markets. 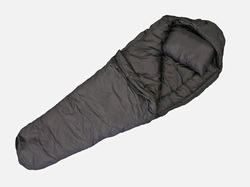 When combined in the FTRSS the Super Lt. is one of the greatest choices for a true four season sleeping bag! When the over bag is added to the Ultima Thule the temperature rating becomes -60 degrees F or C. When both bags are combined you have the Ultima Thule FTRSS. A -60 degree bag. I believe the Antarctic model is the only -60 degree bag made in the world. The loft averages 10 inches, and the weight for a regular length, wide body model is 6.5 pounds. The long wide body weighs 7 pounds. Adding the Flexible Temperature Range Sleep System (FTRSS) brings the temperature range down to -80. The Over bag is a +35 degrees F (approximately +5 degrees C) rated mummy style bag. It is available in four sizes; 33 inches wide in the torso and 82 inches long (regular regular) (weight 2 _ lbs. ), 36 inches wide and 82 inches long (regular wide body) (weight 2 _ lbs. ), 33 inches wide and 92 inches long (long regular) (weight 2 _ lbs. ), and 36 inches wide and 92 inches long (long wide body) (weight 3 lbs.). Please note the larger size for the over bag, so it will fit comfortably over any of the other bags when the FTRSS is created. Also note that a larger roomier bag is necessary for warm weather use. GUARANTEE: Our Guarantee is for a lifetime of use. If a seam opens, the zipper breaks or the Lamilite insulation deteriorates (such as losing its loft or separating, clumping in one place or another), Wiggy’s will repair or replace your bag at no charge to you. At this time, I know of no sleeping bag manufacturer that would even consider such a guarantee. The reason is simple: they already know the insulation they use will deteriorate. If you have ever compared information from the different sleeping bag and extreme cold weather garment manufacturers, you will see that they have never guaranteed the insulation they use, nor do they now. I will explain why only Wiggy’s can make such a guarantee. The single most important component of any insulated product, be it a sleeping bag, parka, bib, snowsuit, booties or mittens, is the insulation inserted into these products. All insulated Wiggy’s products have only one insulator, LAMILITE. Lamilite is the best material developed thus far, for use as insulation for sleeping bags or outerwear. I believe that our sleeping bags and extreme cold weather outerwear are so good that to purchase any other brand is a waste of money. To purchase a sleeping bag with any less quality could not only mean a very unpleasant camping trip, it could also mean your life. I say “your life” because I believe a sleeping bag is the most important piece of equipment you take into the field. The functional difference that truly sets the Wiggy’s Bag apart from the rest is its insulation! Lamilite possesses an extraordinary quality that helps contain the flow of heat that your own body generates. The key to Lamilite is its ability to allow the body’s own thermostat to function efficiently. Lamilite is lofty insulation. The more loft surrounding your body, the more difficult it is for your body heat to escape. Lamilite is lightweight. 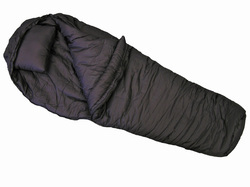 The lighter the weight of the insulation the lighter the weight of the finished product be it a sleeping bag or garment. therefore, the loss of heat via conduction is minimized. heat loss from your body. The spaces between yarns in this construction allow the moisture your body produces to easily escape. It is irrelevant how dry a climate may be, your body gives off moisture. Therefore, it is important to allow this moisture easy exit. Water is extremely efficient at absorbing heat, so you always want to stay as dry as possible.